Men & women welcome! No golf experience needed! Clubs will be available to rent! 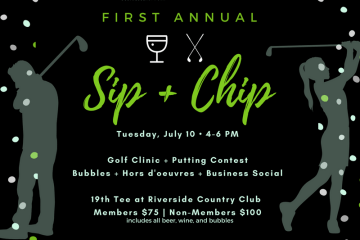 Guys and gals, join Montana Women’s Business Center for our First Annual Sip N Chip event on Tuesday, July 10 at The 19th Tee at Riverside Country Club. Attendees will participate in three 15 minute golf clinic rotations led by Riverside Country Club’s professional golf staff, including Head Pro Brandon Kahl while enjoying wine, beer, and bubbles. An optional putting contest will take place at the conclusion of the lessons to put your skills to the test! A business networking social will follow including door prizes, interactive contests and hors d’oeuvres. This new event is limited to 50 attendees, so be sure to secure your spot today before it sells out!